Clipstone Colliery was founded by the Bolsover Colliery Company in 1912. Work was suspended in 1914 owing to the outbreak of war, and resumed in 1920. The first photograph shows the start of the colliery with the shaft being sunk, was this before or after the war as coal was not reached until April 1922. The second photograph shows the final closure, which one, as it had several owners and closures in its final years? Pete, Malcolm Leivers, Mick Smith, Skegness, 1956 hols. It rained every day. Edwinstwowe, Black Swan pub, Brin Kerry…rockxroll. 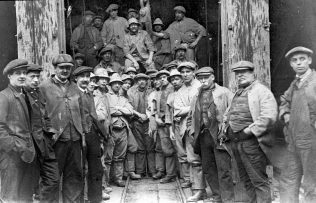 All my mates worked at the pit, good hard working people. Garth Holmes is now in South Africa, Natal and I live in Queensland, on Bribie Island ,swim each day in warm water and sun, like Vicars Pond splash outs. Regards and respects to all our oldmates. Cheers to you all.